Benefit Ultra Plush Lip Gloss Swatches and Launch! 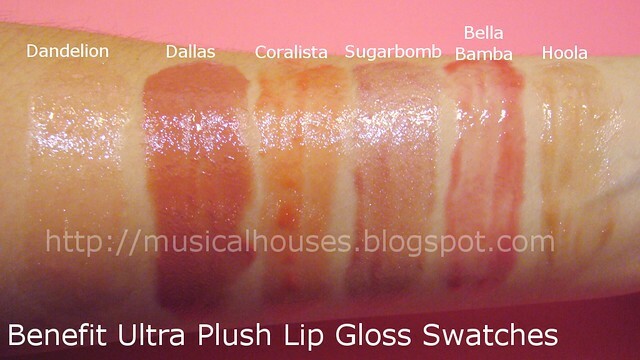 Benefit, the San Francisco-based beauty company with a touch of quirk, is launching thier Ultra Plush Lip Gloss in July! There are 6 shades, and each shade has a name that corresponds to a colour of Benefit's famous boxed powders, which I personally think is a really cute touch. So you'll now be able to get a lipgloss in the shade of your favourite blush or bronzer! These also come in practical squeeze-tube packaging. Of course, I've swatched all of them for you. What kind if blogger would I be if I didn't? So here you go! The first thing you'll notice is that the glosses aren't exact one-to-one matches for the boxed powders, but they do capture the essence of the shade name. Dandelion is a sheer light pinky-peach with no shimmer. A pretty, girly shade, just like the boxed powder. Dallas is my favourite - it's a lovely creamy pinky-brown shade - you know, one of those universally flattering shaded everyone can wear. It's also surprisingly pigmented, which I personally think is a good thing. Coralista is a semi-sheer coral with gold shimmer. Very summery and pretty. Sugarbomb is a sugarbomb of a shade - a semi-sheer pretty pink with shimmer. Bella Bamba is a slightly sheer, slightly warm red with no shimmer. This is also one I like. Hoola looks ugly and brown in the tube, but in reality, it's a clear-ish gloss with lots of gold/bronze shimmer that is quite striking. I imagine this would look fabulous layered over a lipstick for dimension. Most of these glosses are sheer, with Dallas being the most pigmented, and Dandelion being the sheerest. The glosses are very light in feel and texture, and don't feel sticky. They also have a nice lychee scent, and the packaging is adorable. The glosses retail for $26. I'll be reviewing these soon, so keep your eyes peeled! Coralista and Bella Bamba looks like really cute lipglosses! These are so pretty, are they long lasting? Nice colors. Benefit always has such radical packaging.